THEY have combined to win four of the past seven fairest and best awards and have been three of South Fremantle's biggest contributors in the recent run of strong form but Ashton Hams, Ryan Cook and Shane Hockey have all played their last games for the Bulldogs. Hams had already announced that the 2018 season would be his last ahead of one more finals campaign in his decorated career, but now the club's longest-serving captain Cook and 2016 Hughes Medal winner Hockey have decided to join him. The trio have been tremendous servants of the South Fremantle Football Club as teammates for the past three years as part of teams that finished in second position at the end of the home and away season on each occasion, and reached the preliminary final the last three years. 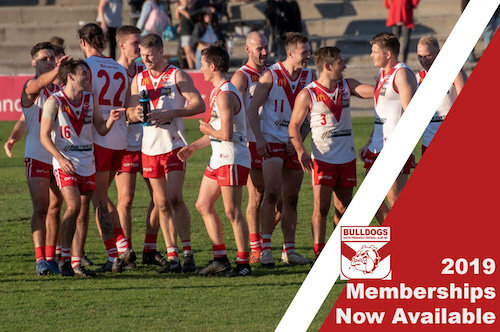 Beyond that, Hams and Cook have been teammates since Cook's arrival at the Bulldogs in 2011 and Hams is now the last of the 2005 premiership players at South Fremantle to move on. 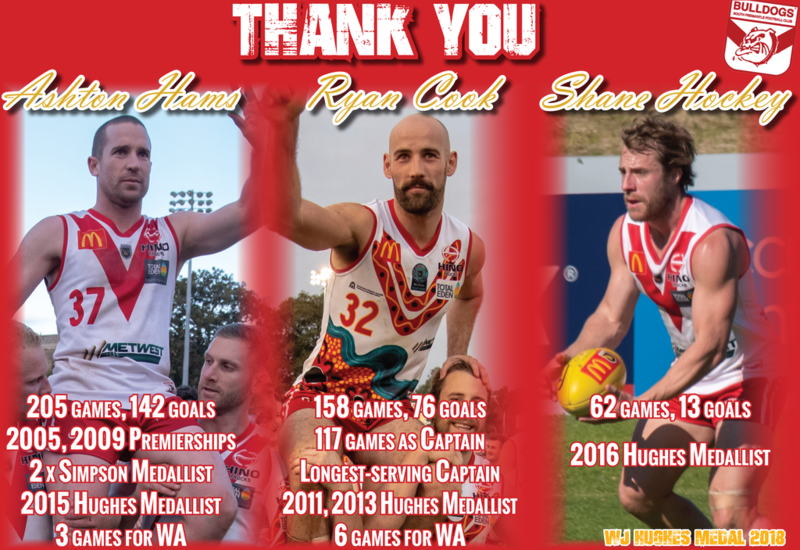 The trio have all made remarkable contributions to South Fremantle combined to play 425 matches, win four Hughes Medals and play nine matches for Western Australia. But it will be a vastly new-look South Fremantle team in 2019 with the trio having announced their retirements and having their decorated careers celebrated at the WJ Hughes medal night last Friday at Fremantle's Esplanade Hotel by Rydges. Hams will go down as one of South Fremantle's all-time greats and as one of the most decorated players in the history of the club. He began his career with colts and reserves success alongside twin brother Kyle with the pair quickly becoming regular and important members of the league team playing in the premierships of 2005 and 2009. Ashton would win the Simpson Medal for his best on ground performance in the 2009 Grand Final win over Subiaco and that led to him being drafted to West Coast where he would go on to play 39 AFL matches. 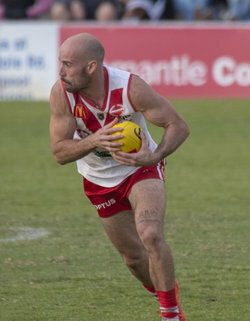 He returned full-time to South Fremantle after deciding to call time on his AFL career and would go on to win the 2015 Hughes Medal, make his three appearances representing WA and winning a second Simpson Medal for his performance in the 2014 State Game victory against the NEAFL in Sydney. 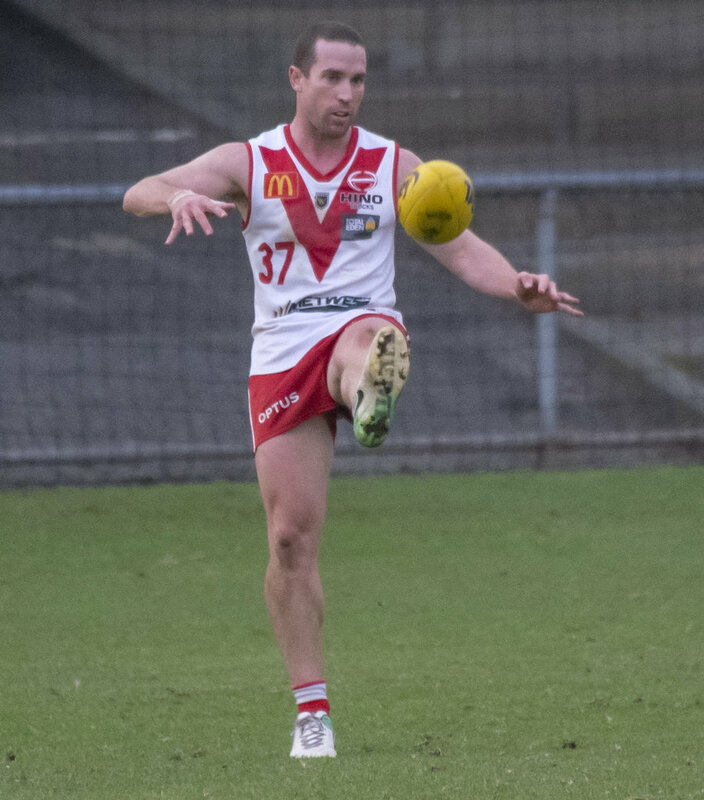 Hams would pass the 150-game mark to earn life membership at South Fremantle and late in the 2018 season also reached the 200-game milestone becoming just the 19th player to do so, the first since Toby McGrath and the only one to have made their debut after the turn of the century. Hams is now a father of two and will move on to the next stage of his life, but with 205 games and 142 goals under his belt at South Fremantle including the two premierships, two Simpson Medals and three games for WA on top of the life membership, it has been a remarkable journey. The story of Cook since joining South Fremantle for the 2011 season is an incredible one as well. Following four years and 14 AFL matches with Collingwood, Cook made the move west for that 2011 season and made an immediate impact winning the Hughes Medal and playing State football highlighting how quickly he settled into life in WA and playing in the WAFL. He would go on to be named captain for 2012 as well and remained in that position until the end of the 2017 season meaning he skippered the Bulldogs for 117 matches making him the longest-serving captain in the history of South Fremantle, surpassing Peter Worsfold. Along the way, Cook won another Hughes Medal in 2013 and was runner-up on another two occasions highlighting his terrific consistency. He would go on to play six matches all up representing the WAFL and earned life membership during the 2018 season by reaching 150 games. All in all, Cook retires from South Fremantle having played 158 games as a dual fairest and best winner, life member, longest-serving captain and a six-time State representative making it quite the incredible journey from where he was when he first arrived in 2011. 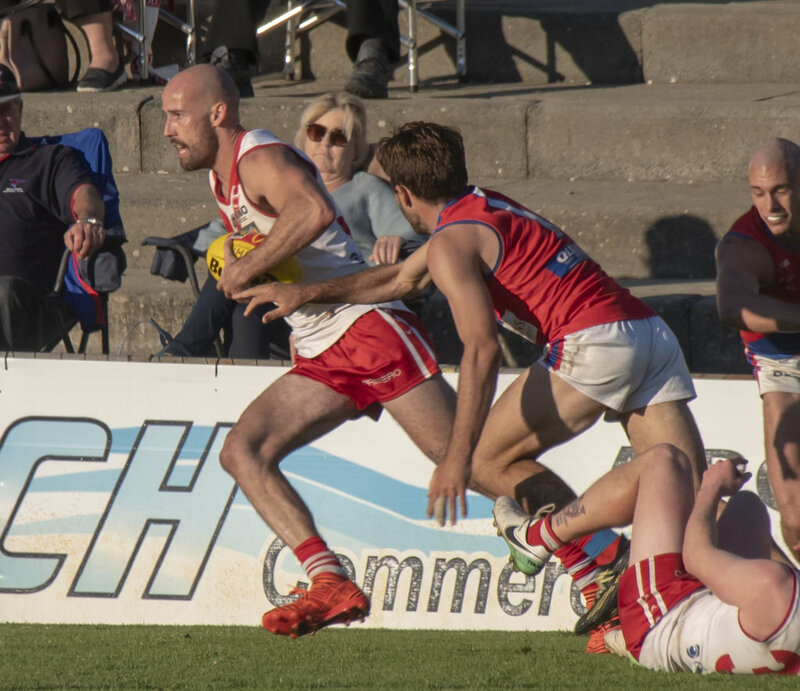 Hockey might have not quite had the longevity as Hams and Cook with the Bulldogs, but he provided South Fremantle with tremendous service over the past three seasons. Having already arrived as a 100-plus game VFL player and a captain of Frankston, Hockey was an experienced and readymade midfielder who fitted in instantly with South Fremantle. Hockey was so good immediately at the Bulldogs that he won the 2016 fairest and best award in a team that finished second on the ladder and reached the preliminary final. He backed that up with a good season in 2017 and then went up another gear again in 2018, with an especially brilliant start to the season before copping a heavy knock early on against Claremont in Round 8. 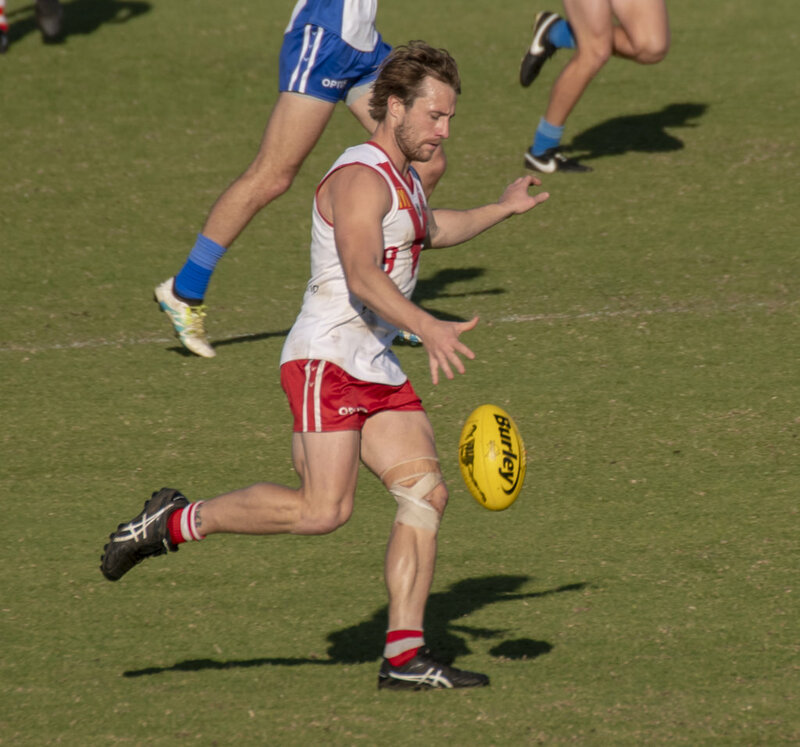 That ended up knocking him around for a little while, but for the last month of the home and away season and the finals, he was playing some of the very best football of his career leading into his last match with South Fremantle in the preliminary final loss to West Perth. Across three years, Hockey played 62 games, averaged over 24 possessions and won a Hughes Medal award making him a tremendous experienced recruit for a group desperate to try and breakthrough to fight for that elusive premiership.